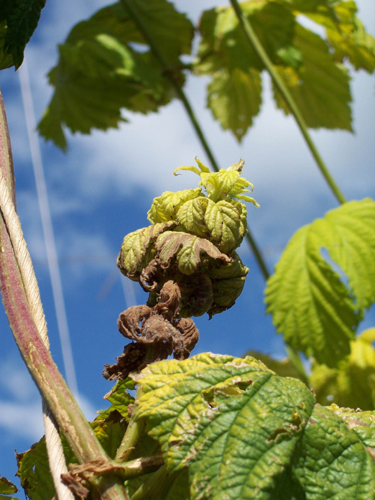 Aerial spike present on hop bine. 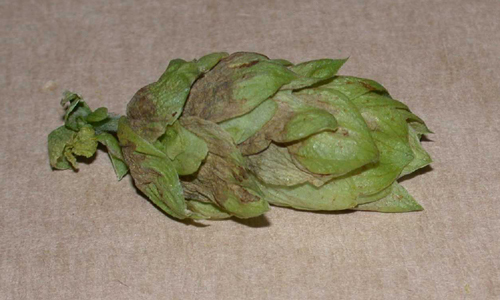 Hop cone with downy mildew infection. 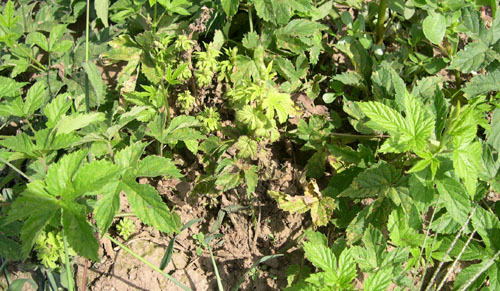 Note the shoots with shortened internodes, characteristic of hop downy mildew. Cause The fungus-like microorganism, Pseudoperonospora humuli, persists from year to year in infected hop crowns or plant debris in soil. It is an obligate parasite specific to hop. Disease is promoted by wet or foggy weather. Symptoms In early spring, spike-like infected bines rise among normal shoots from the crown. Spikes are silvery or pale green, rigid, stunted, and brittle. The undersides of leaves may be covered by profuse sporulation by the pathogen and appear dark purple to black. Tips of normal branches may become infected and transformed into spikes. Leaves of all ages are attacked, resulting in brown angular spots. Flower clusters become infected, shrivel, turn brown, dry up, and may fall. Cones also are affected, becoming brown. Severe infection in some susceptible cultivars may produce a rot of the perennial crowns. 'Fuggle' and 'Tettnang' are resistant. 'Willamette', 'Mt. Hood', 'Chinook', 'Liberty', 'Cascade', 'Bullion', and 'Brewers Gold' are tolerant. 'Clusters', 'Galena', and 'Nugget' are susceptible. Destroy escaped hop bines near or in hop yards. Prune crown before growth starts in the spring or burn back green tissue before training. Complete removal of green tissue or pruning of entire hill is necessary for most effective disease management. Remove diseased hills and mark for replanting. Train bines early to prevent them from coming in contact with soil. Begin suckering as soon as bines are strung. Continue at regular intervals until warm, dry weather prevails (June to July). Strip leaves from bines at a height of 4' soon after training to reduce the spread of downy mildew up the canopy. Avoid overhead irrigation, especially during and after burr development. Note Using metalaxyl products is strongly discouraged in the Willamette Valley of Oregon due to resistant pathogen strains. Metalaxyl-resistance is also found in the Yakima Valley of Washington. Insensitivity to Aliette (fosetyl-Al) is widespread in strains of P. humuli found in Oregon and northern Idaho. The highest labeled rates of Aliette should be used where insensitive strains are known to occur. Drench crowns after pruning but before shoots are 6 inches long and/or before training. Badge SC at 0.75 to 1.8 pints/A on 10-day intervals. Discontinue use two (2) weeks before harvest. 24-hr reentry for greenhouse use; 48-hr reentry for all other applications. Champ Formula 2 at 1.33 pints/A. Do not apply within 14 days of harvest. 48-hr reentry. Kocide 3000 at 0.75 to 1.75 lb/A. Do not apply within 14 days of harvest. 48-hr reentry. Metalaxyl products such as Ridomil Gold SL at 0.5 pint/A or MetaStar 2E AG at 1 quart/A in at least 20 gal water as soil drench over crowns when plants are 6 inches or less, tank-mix with a copper fungicide registered for hop. Do not apply within 45 days of harvest. 48-hr reentry. CAA-fungicide (Carboxylic Acid Amides) formulations (Group 40) in combination with another fungicide that has a different mode of action. Do not apply more than once before alternating to a different mode of action. Forum at 6 fl oz/A. Do not apply within 10 days of harvest. 12-hr reentry. Revus at 8 fl oz/A. Do not apply within 7 days of harvest. 4-hr reentry. Copper products are not effective as stand-alone materials. Care must be taken to avoid build-up in the soil. C-O-C-S WDG at 1 lb/A. Not widely used due to low efficacy. 48-hr reentry. Nordox 75 WG at 1.25 lb/A on 10-day intervals as needed. Apply up to 14 days before harvest. 12-hr reentry. Cymoxanil products (Group 27) such as Curzate 60DF at 3.2 oz/A or Tanos (Group 11 + 27) at 8 oz/A. Must be tank-mixed with an appropriate fungicide with a different mode of action (non-Group 27). Do not make more than one (1) application before alternating with a fungicide that has a different mode of action. Do not apply within 7 days of harvest. 12-hr reentry. Folpan 80 WDG (Group M4) at 3 lb/A on 28-day intervals. Do not apply within 14 days of harvest. Folpan 80 WDG when used for downy mildew control will provide some suppression of powdery mildew. 24-hr reentry. Phosphonates formulations (Group P7) are becoming less effective. Minimize use of these materials in western Oregon. Fosetyl-AL products such as Aliette WDG at 2.5 lb/A (SLN OR-040018 for air application) or Linebacker WDG at 5 lb/A. Do not tank-mix with copper products. Do not apply within 24 days of harvest. 12-hr reentry. Fosphite at 1 to 3 quarts/100 gal water/A on 14- to 21-day intervals. 4-hr reentry. Ranman (Group 21) at 2.1 to 2.75 fl oz/A. Do not apply more than three (3) applications before alternating to a fungicide with a different mode of action. Preharvest interval is 3 days. 12-hr reentry. Strobilurin compounds (Group 11) such as Flint Extra and Pristine will provide suppression of downy mildew when used for powdery mildew control. Tanos (Group 11 + 27) at 8 oz/A. Must be tank-mixed with an appropriate, effective fungicide with a different mode of action. Do not make more than one (1) application before alternating with a fungicide that has a different mode of action. Do not apply within 7 days of harvest. 12-hr reentry. Zampro (Group 40 + 45) at 11 to 14 fl oz/A. Do not apply more than two (2) applications before alternating to a fungicide with a different mode of action. Preharvest interval is 7 days. 12-hr reentry.